Mac and iOS users are going to be increasingly pushed to choose between storing their documents in iCloud or Dropbox. I expect that Apple will continue to push more and more features to iCloud that will make people want to use it, and I expect that Apple will continue to make iCloud easier and easier for iOS and Mac developers to use, so developers will want to support it. I like the idea behind iCloud, but I don't really trust iCloud yet. Apple's previous attempts at online services have left me suspicious about iCloud's performance, reliability, and long-term future. I hope I'm wrong and that iCloud turns out to be great, but in the meantime, I know Dropbox, and I trust Dropbox. One of my favorite features of Dropbox is the ability to go back and see revisions from the previous 30 days. It's my safety net. I'm going to use Byword as an example because it's fairly straight-forward, but the process should work roughly the same for any iCloud enabled Mac app. Step One: Make sure iCloud is enabled. Go to System Preferences » iCloud and make sure that you have "Documents & Data" set to sync. Step Two: Create an iCloud-based file. The exact process for this differs from app to app. Byword has a File » Move to iCloud menu item. You'll find something like the list of directories shown here. Inside each one is a "Documents" sub-directory. I bet you can guess what is stored in there. Step Four: Sync changes via Hazel. Hazel was recently updated to version 3, and one of the new features is a 'sync' option. For those who don't know Hazel, you should, it's one of my irreplaceable apps. It allows you to create rules for all sorts of actions to happen in specific folders if different criteria are met. For example, Hazel can tell if a file has been modified since the last time Hazel checked a specific folder. If it has been modified, you can tell Hazel to do specific things, including "sync" from that folder, so another one. I created a 'Byword' folder in my ~/Dropbox/ and then created a Hazel rule which says "If any files have been modified since we last checked (matched) this folder, then sync the 'Documents' folder (located inside ~/Library/Mobile Documents/) with the Byword folder in Dropbox. Step Five: (Optional) While I was checking around inside ~/Library/Mobile Documents/ I used Default Folder X to set the Byword iCloud folder to be the default folder for all new Byword documents. Now whenever I create new document on my Mac using Byword, I know that it will automatically be saved to iCloud and Dropbox. This isn't something that I will do for all of my iCloud-enabled apps, but I've been using Byword more and more lately for all sorts of writing projects, and I want to do everything I can to make sure that I am "covered" when it comes to saving my files. 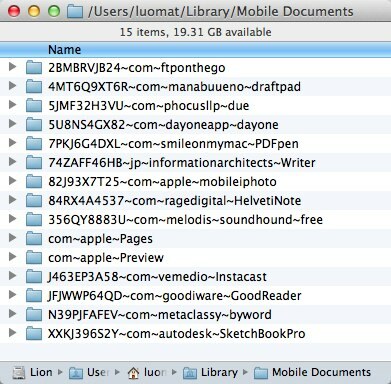 Two local copies (one in Mobile Documents, one in Dropbox folder) and two copies in the "cloud" (iCloud and Dropbox sync), plus 30 days worth of "undo"? (Not to mention that each of my Macs will have local copies as well, as iCloud and Dropbox sync across my network.) That's a system I can create and then forget about.